17 April update: Looks like this deal has ended already! Here are the current best GoPro deals. Here's a nice little GoPro Easter treat for you: the GoPro Hero7 Black – that's the best GoPro in the current range of GoPro's action cameras – is currently on sale at Currys for just £299. That's a saving of £80, which is the best price we've ever seen for this top-of-the-range camera. Previously, the lowest price we've seen the Hero7 Black go for was at Amazon when it was reduced to £319. This the first time we've ever seen this action cam going for under £300, so we're sounding the GoPro deal klaxxon – it's not just a deal, it's a full-on steal! The Hero7 lineup of GoPro action cameras was released in September 2018 and consists of the top-end Hero7 Black, the mid-range Hero7 Silver, and the cheapest entry level model the Hero7 White. Given that the Black model is the best in the range, it's the one we're always happy to see get a discount so this £299 offer at Currys is a sweet deal and right in time for your Easter break adventures. And it soundly beats GoPro's own Easter price cut to £329 on GoPro.com. The Hero7 Black shoots 4K video at 60fps or 12MP stills and features GoPro’s HyperSmooth tech – exclusive to the Black model – to stabilise your images. The camera also brings improved three-mic audio capture, voice control, an intuitive user-interface and 2-inch touchscreen, resulting in a supremely versatile action cam to capture your next epic adventure. We gave the Hero7 a full five stars in our GoPro Hero7 Black review, so it's safe to say we really like it. The best price right now – and we have no idea how long it will stay this cheap, so you might want to hurry – is below. 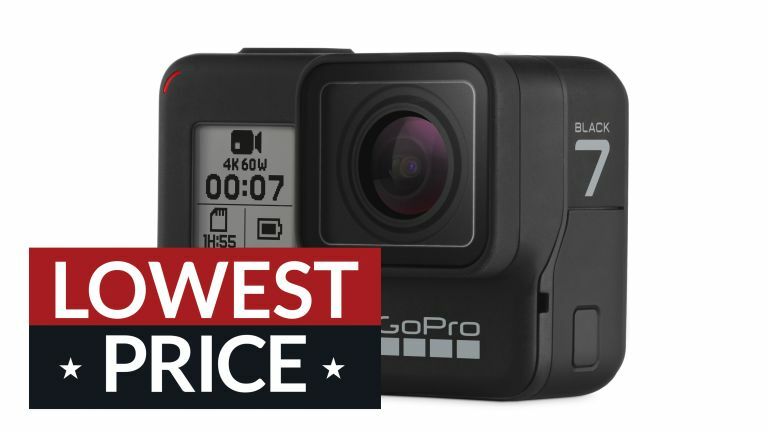 For more GoPro deals, including deals on the Silver and White versions of the camera, check out The best GoPro deals, and the live GoPro Hero7 Black prices shown below.